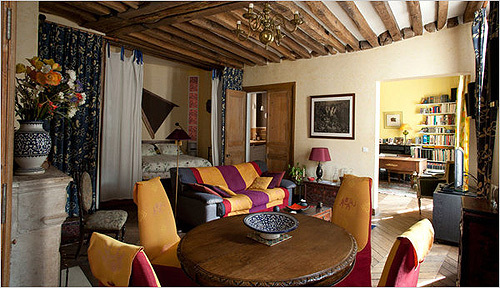 the Big World Blog: Paris Apartment - one and a quarter million euros bargain? Paris Apartment - one and a quarter million euros bargain? Set among the antiquated buildings of the storied Left Bank, this one-bedroom apartment retains the charm of its restored 17th-century building with exposed wooden beams, parquet wood floors and oak doors with original locks. Located on the fourth floor of the five-story structure, the apartment has a view of the rooftops of the Saint Germain des Prés quarter, famous for its intellectual and cultural history as well as its bistros, cafes, bookshops and galleries. As with many Parisian buildings of this era, the limestone facade is pierre de taille, or ashlar stone masonry, and the structure was built to house a shop or business on the lower level with apartments above, along with a rooftop terrace, probably used for drying fruit or coffee, said Vanda Roudneva-Doncelle, the listing agent with Coldwell Banker Previews by Demeure Prestige. Now the building, which is right off of Boulevard Saint-Germain, is all full-floor apartments. The 645-square-foot apartment features a living room with a working fireplace of 17th-century white marble from Lorraine in northeastern France. Bordering the fireplace is an 18th-century carved oak structure that supports a large mirror and a closet. The honey-colored wooden floor is point de Hongrie, or flame stitch, parquet. Facing the southwest, the room has high ceilings and large double casement windows with ornate window catches that provide ample light during the day. Off the living room is a separate room, currently used as an office, with a working 19th-century black marble fireplace. Beside the alcove bedroom with a nearby dressing room is a full bathroom with a bathtub, a spa shower and two basins. Though the kitchen is completely modernized it has old-fashioned touches like white-enameled beechwood cabinets. The countertops and a backsplash above the stovetop and sink are laid with the earth-toned herbier ceramic tiles of the French artisan Roger Capron. The floor of the kitchen and corridor are covered with traditional French hexagonal tiles of red clay, or tomettes. The building is on Rue de l’Ancienne Comédie, near one of the world’s oldest restaurants, Café le Procope, which serves standard French dishes. Rue de l’Ancienne Comédie, once the haunt of the playwright Molière, is just a few minutes’ walk from Luxembourg Garden, or in the other direction, the Seine and Île de la Cité. The building is also close to the Odéon Metro stop and about 30-minutes’ drive to Paris-Charles de Gaulle Airport, Ms. Roudneva-Doncelle said. The price of this apartment is about average for similar apartments in the Saint Germain des Prés neighborhood, which is less expensive than, for example, the Golden Triangle in the Champs-Elysées district, the most prestigious part of Paris and popular with foreign buyers, Ms. Roudneva-Doncelle said. Prices for apartments in Paris have never been higher, due to a housing shortage aggravated by high demand, said Yves Raphalen, a real estate agent with Belles demeures de France Fine Residences, an affiliate of Christie’s International Real Estate. Apartment prices increased about 20 percent in 2010, agents said, and that trend is expected to continue in 2011. For a good quality apartment in the center of Paris, such as this apartment on Rue de l’Ancienne Comédie, buyers will be paying 15,000 to 25,000 euros a square meter (or about $1,980 to $3,300 a square foot), said Pascale Constans, an associate director of Propriétés Parisiennes Sotheby’s International Realty. Most American buyers seek the charm of a historic village in Paris, leading them to neighborhoods like Saint Germain des Prés, Le Marais, Montmartre and the Île Saint-Louis, Mr. Raphalen said. As apartment prices in Paris shot upward the American dollar declined against the euro. With that phenomenon, along with the economic downturn, American buyers essentially disappeared from Paris about four years ago, said François-Xavier de Vial, the director of Home Hunts Luxury Property Specialists. In the meantime the market has seen growing numbers of buyers from Italy, Russia, China and Middle Eastern countries, along with a steady flow of British and other European home seekers. Recently, Americans have slowly been returning to the market, Mr. de Vial said. There are no restrictions on foreign buyers, but all buyers must hire a notary and pay the notary fee along with transfer taxes — which together amount to 7 percent or 8 percent — directly to the notary, said Ms. Constans of Sotheby’s. The notary processes all the paperwork, which includes a preliminary contract and deed of sale, for the buyer and seller. The notary ensures that conditions in the purchase agreement are fulfilled, she said. Typically, buyers may be asked to put down 20 to 30 percent. Mr. de Vial said a financing broker would be able to help buyers minimize levies like the country’s “wealth” tax, which the government collects from all residents of France.